Using only a operation lever. 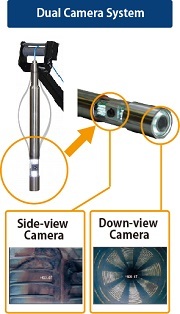 Dual wide angle cameras, one side view and one down view, with remote switching and continuous 360 degree rotation. Recorded movies and images are stored into the internal flash memory. It can be also stored into an external USB thumb drive. It is enable more efficient handling of data and it's easy to make any documents. It can be selected to supply with electric power either outlet or portable battery box. 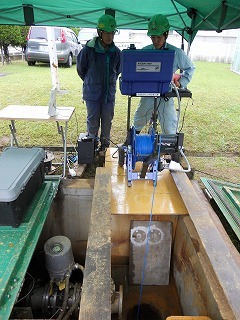 Rating Pressure tested and waterproof to 500 p.s.i. Connector Kevlar-reinforced, small diameter coaxial cable. Single conductor electronic technology. ※ Selectable 12VDC car battery box instead of AC100V. 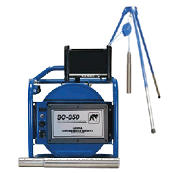 Control 360 degree rotation to the right and left with no external moving parts. 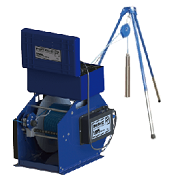 Control for either downhole or side-view video profile. Lighting Five adjustable stages of brightness. Recorder Flash based hard drive with 16GB of internal storage and 16GB of external USB storage. output 1 pin for microphone and 2 USB connections for key board and USB thumb drive. The latest catalogue is released on OCT 15th, 2018! We have Japanese version catalogue only..Sorry! Please click on the above picture if you want to download our catalogue. The other window is opened for PDF. ※ You should need PDF viewer. ※ PDF can be saved by renamed. ※ Adobe Acrobat reader is able to free download here to click. These photos are automatically replaced every five seconds. TriLight is an Auxiliary Lighting System to supplement the standard lighting of the R-Cam 1000. The itme is only DOWN view. 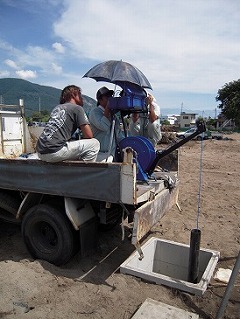 Portable Camera System for Water Wells and Boreholes from 2 inches (5cm) to 10inches (25cm). *It is only down view. 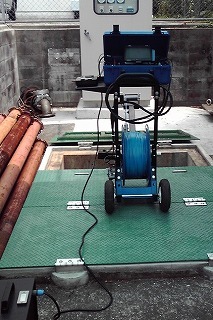 Portable Camera System for water wells and boreholes. 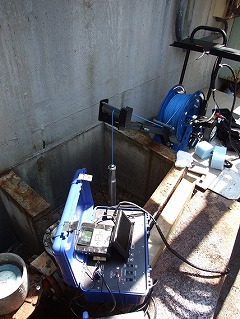 Designed to reach depths of 450m(DW-1500) & 610m(DW-2000). 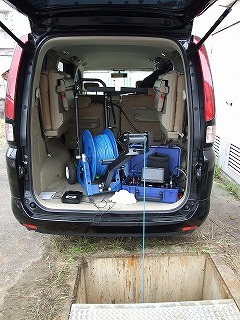 *2 -- It is need R-CAM Control Unit. *3 -- It is need CU500 Control Unit. Specialties Functionality and Portability. Simple! Low price! Note: *4 -- It works only down view. Accessories All parts are mounted on a small, two-wheeled cart with extendable 36-inch boom. Depth-Counter Tripod Assembly. All the necessary components, mounted on skid plate. If you have any questions, plase contact us from the link of "Contact Us" right-top in this page. We will contact to you after confirmation as soon as possible.